We have already seen WhiteHouse.org’s brand new blog and HQ inauguration images clicked from space. 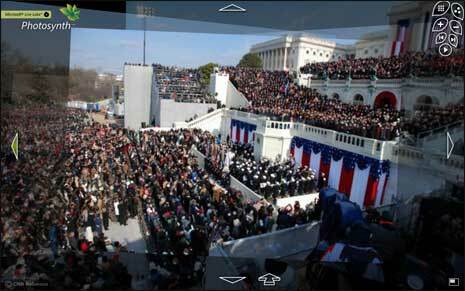 Here is the best one – 3D view of Obama Inauguration ceremony created by images clicked by people attending the ceremony. Number of people have submitted images clicked by them to CNN website. Using PhotoSynth application, 3D view is created from number of 2D images. End result resemble 3D view of event shot by actual camera. Following is the screenshot of 3D view of ceremony. Click here to viewÂ Obama event in 3D. You can click on arrows to move in any direction – don’t forget to use mouse scroll wheel to zoom in / out. Also, be patient as images will take sometime to load if using slow internet connection and just enjoy the view! How to shoot, record & upload 3D videos on Youtube?